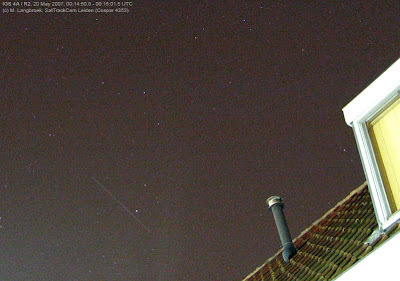 SatTrackCam Leiden just experienced a few beautifully clear, dark & transparent nights. The result is a fine batch of positions on several objects, including Keyholes (USA 161), Lacrosses (3, 4 & 5), USA 193 and the old & new Japanese IGS-es. The latter include my first positions on IGS 4A/R2 (07-005A). 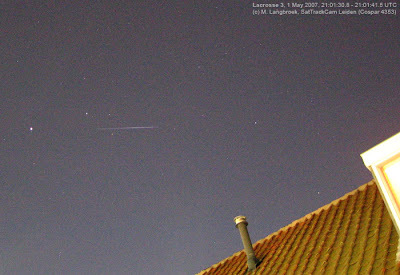 The first capture of the latter object was when I was waiting for its rocket launcher (IGS 4r/R2r, 07-005C) on the night of May 17-18. Suddenly a bright (+2) object appeared 2 minutes before 07-005C should, following a similar trajectory. I made a photograph and then found out it was the A component. Due to a goof from my side I initially thought it was the optical satellite (due to it having the "A" designation, analogue to IGS 1A, 03-009A) and hence was surprised to find it was so bright. Only later I realized it is the (intrinsically brighter) radar sat. Keyhole USA 161 (01-044A) was observed flaring on the 18th at 00:12:50 UTC (-1.5, slow) and 00:14:13 UTC (-1, short). USA 193 (06-057A) was bright. Lacrosse 5 (05-016A) was elusive. On the 18th, it initially was +2 low in the sky but then quickly faded beyond vision for much of the pass. 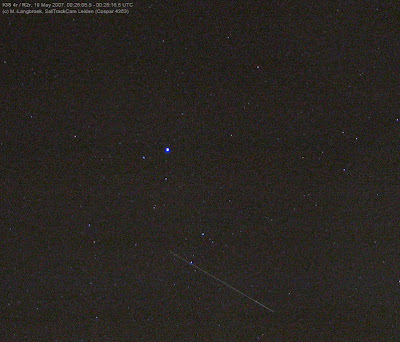 Below are trail images of the "new" IGS 4A/R2, it's rocket 4R/R2r cruising through Lyra, Lacrosse 3 cruising amongst the Coma cluster stars, and an Iridium flare in twilight. 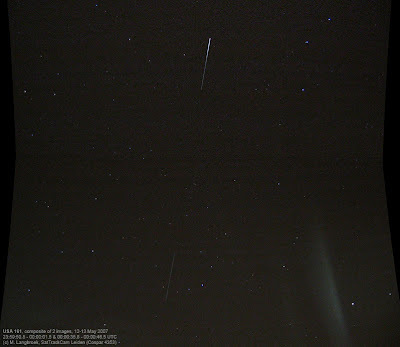 Below image is a composite of two 10.7 second images, 35 seconds apart, made during yesterday's USA 161 (01-044A) pass. It includes the flare image posted earlier. The stitch of the two images was made with Hugin/PTStitcher, the same software I use for my daylight panorama images. The flare effect is even more accentuated in this composite, and the wide angle (roughly 50 x 50 degrees) makes several constellations well recognizable. The glare in the lower right corner is reflection from a lamp on the courtyard. (this image is of course reduced in size and compressed compared to the original, hence the fainter stars are lost). Yesterday evening was very clear, thanks to a strong wind blowing the clouds away. I could observe until 3 am, when clouds came in again. Highlight of the session was Keyhole satellite USA 161 (01-044A). It was very bright for much of its pass (about +2) and then flared to mag. -1.5 at 00:00:46 UTC. It was so nice to do that while the camera was open: image is below. Other catches included Lacrosses 3 & 4 (97-064A & 00-047A) and IGS 1B (03-009B). 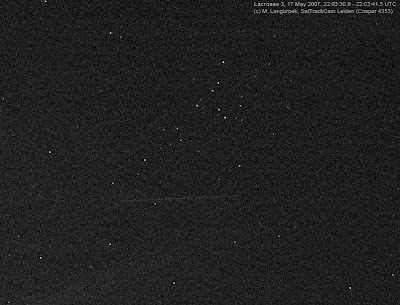 One of the Lacrosse 3 images also captured a stray, which turned out to be the Kosmos 2292 SL-8 rocket (94-061B). Several other bright strays were seen, three of them flaring nicely, while preparing the camera. I had USA 161 some 0.6s late, IGS 1B some 2.6s late, Lacrosse 4 some 0.4s late, and Lacrosse 3 some 0.3s early. Phil Masding provided me with a number of potential flare time predictions for Lacrosse 3 (97-064A). The aim is to determine at what angle flares will be no longer visible. Two of these predictions were for yesterday evening and as the sky was very clear again, I covered both. At 21:30:38 UTC (2 seconds after the nominal prediction) and almost right in the zenith for me, Lacrosse 3 indeed "flared", albeit very modestly. The short increase in brightness was no more than say 0.5 magnitudes but discernable. 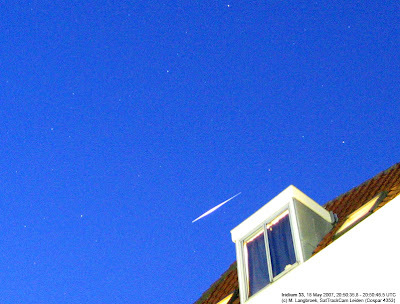 Below is the image (visually, the "flare" was somewhat better discernable). On the other hand, during the second predicted time (23:12:38) Lacrosse 3 did nothing, it was steady as usual. 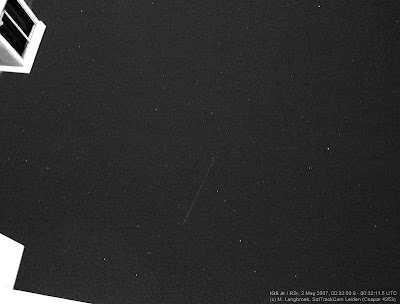 I managed to observe one of the new Japanese IGS eastern plane objects for the first time this night (see image below). It concerned the rocket-booster, 07-005C (#30588), which amateur trackers name either IGS 4r or IGS R2r. It made a zenith pass and was bright and easy, mag. +1.5 in the zenith and about +2 when passing close to Polaris. It was steady, no sign of tumbling. Another very clear evening in which the sky was so transparent that the moon was no real hindrance. I observed 3 flares. 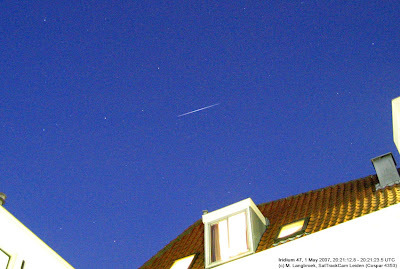 Iridium 47 flared to mag. 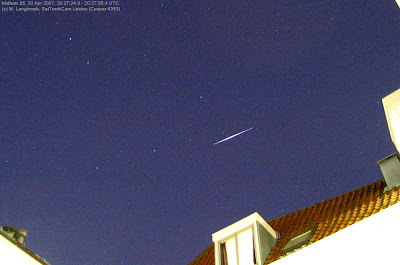 -1.5 in twilight at virtually the same spot as yesterday's -6 Iridium 25 flare. The picture is below. 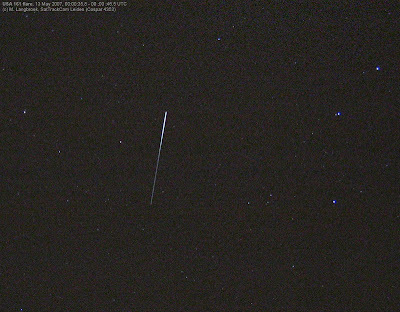 At 20:52:23 UTC I saw USA 186 (05-052A), which was faint during the rest of its pass, flare to mag. -2 in the north. Alas not on photograph. I was more lucky with Lacrosse 3 (97-064A) which flared to mag. 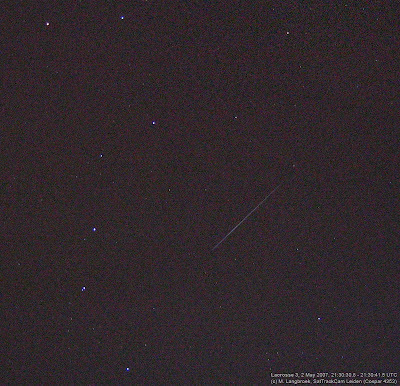 +1.5 at 21:01:34 UTC while the camera was open (see below image, the bright star left is Arcturus). I also observed IGS 1B (03-009B), on a zenith pass. It was faint again and irregular, quite unlike its visibility in earlier years. I am very tired currently, but given the unusually clear skies I might try some additional observations this morning on the new IGS objects. It was very transparent last night, to the extend that the full moon didn't seem to hamper much. Alas I had not much opportunity to observe, as I was franticly making the last final edits to a research proposal, the dead-line of which was this afternoon. Main focus at the moment is still on gathering material to calibrate the times of my camera. Currently a recalibration of -0.30 s (as opposed to the -0.35s I initially took) seems to get times in line. Interestingly, this -0.30s means the time calibration value is similar again to that which I initially obtained way back in August 2005. It then jumped by 0.3s after I made a change in my camera settings in September 2005. Apparently now it is back at the old value again. I did not consciously make another change in my camera settings, but have accessed the camera recently with Canon software to test that software, and apparently it did change settings.